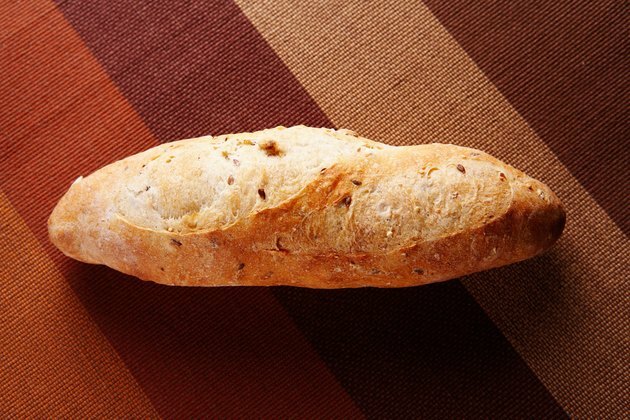 The French baguette is a thin, long loaf of crusty bread with a soft interior traditionally made from white flour and is named after the French word for "wand." The French baguette originated in Paris but can be found in bakeries all over the world. If you enjoy this crusty loaf, knowing its nutrition information can help include it in your healthy diet plan. A 2-oz. serving of French baguette contains 150 calories. By comparison, the French baguette contains about the same number of calories as a 2-oz. serving, usually about two slices, of sliced white or wheat bread. The bulk of the calories in the French baguette come from its carbohydrate content. A 2-oz. serving contains 30 to 32 g of carbohydrates, about the same amount found in two slices of white or wheat bread. Your body uses the carbohydrates in the bread as a source of energy to fuel not only your physical activity but also the activity of your brain and organs. Carbohydrates are the nutrient your body needs in the largest amount and should provide 45 to 65 percent of your daily calorie intake. If you follow a 2,000-calorie diet, you need about 225 to 325 g of carbohydrates a day. The French baguette is virtually fat-free and provides a small amount of protein. A 2-oz. serving contains 0 to 1 g of fat and 5 g of protein. Both protein and fat are essential nutrients your body needs to function properly. Fat supports growth and development, provides energy and is necessary for the absorption of certain essential vitamins. Your body will use the protein in the bread to help build some of the proteins found in your body, including hormones, enzymes and muscle. A balanced diet should get 20 to 35 percent of its calories from fat, and 10 to 35 percent of its calories from protein. While the French baguette may not taste salty, it makes high-sodium bread choice. A 2-oz. serving contains 370 to 380 mg of sodium. High intakes of sodium is one of the factors associated with the development of high blood pressure. To reduce your risk, limit your daily intake of sodium to 1,500 to 2,300 mg a day. Knowing the sodium content in foods like the French baguette can help you track and limit your intake.